Welcome to the Toffs in the Tenement. The Toffs in the Tenement and The Toffs in the Towerblock are the titles of the Amazon bestselling books by Glasgow author Ron Windward (The eagerly awaited third book The Toffs in the West End will be available shortly). These hilarious Glasgow comedies are set in the slum tenements of Bridgeton Glasgow in 1968 and describe the trials and tribulations of the Nairn family. After living in the affluent West End of Glasgow the Nairn's lose all their money and end up living in a single end flat in Bridgeton. They now have to put up with rough neighbours like the Campbells, mice, outside toilets, the steamie, and much more in this hilarious account of tenement life in 1968 Glasgow. "Authentic to the time, the place and the people. Poignant and humorous. It has all the visual quality of a Budd Neil cartoon and the linguistic quality of 'The Steamie'. So glad I stumbled on this gem". I laughed till my sides ached. "Really enjoyed the book, the characters are so believable and likeable. Mr Windward captures the era so well, the hardships along with the humour, can't wait for the next instalment." 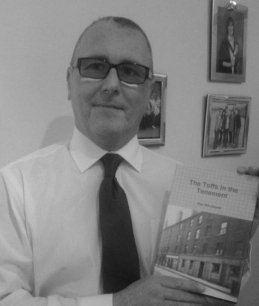 "Best read for years, life as it was it the tenements, very true to life author knows what he's talking about." You can follow me on Facebook and Twitter @ronwindward. Please feel free to sign the guest book.